Oops - we don't appear to have a video for the i280. Plus there's so much more. More speed to let you fly through work faster. More imaging refinements for capturing your most challenging workloads. 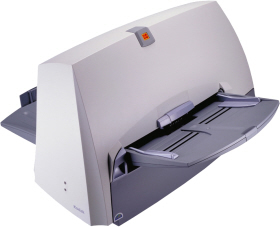 And more paper handling options to allow you to scan just about any document, even up to 20 feet long and beyond! Get ready. The i280 will change everything you expected of a desktop production scanner in this class. Built for speed--including the fastest colour scanning in its class. The Kodak i280 document management scanner zooms through an incredibly wide range of documents at up to 81 pages per minute (162 images per minute). Scan mixed batches with virtually no presorting, and get through your toughest workloads faster. Depending on your application needs, you can select one of five output modes: colour, bitonal, grayscale, simultaneous bitonal and grayscale, or simultaneous bitonal and colour. And in simultaneous output mode, you can get an awesome 248 images per minute at 200 dpi. That's high-performance productivity! These are no ordinary image enhancements. If you want optimized images at full scanning speed, you've come to the right place! The i280 has Perfect Page Scanning with iThresholding, which delivers exceptional imaging for all kinds of information. Signatures, bar codes, logos, handwritten annotations and stamps are captured with accuracy that's close to flawless--all at full scanning speed. Want to increase your OCR read rates? Save file space? Relative Cropping lets you zero in on just the area of a document you need to capture. When it comes to paper handling, the i280 has a very long memory. Of course, you get all the benefits of our renowned SurePath paper handling. And with 256 MB, you get all the onboard memory you'll ever need to capture documents up to 32 inches long. Select the long document mode and you can scan documents up to 20 feet long and more (for electrocardiograms, seismographic charts and other special applications). And the special document mode allows you to auto-feed even the most irregular exception documents.